The yearly show of wildflowers starts with the spring ephemerals, which only appear above ground in late winter and early spring. There are 10 different species of spring ephemerals throughout the park, including trillium, bleeding heart, crested dwarf iris, lady slipper orchids and the showy orchis. They flower and fruit from February through April, then the above ground parts decay before the summer even gets into full swing. The best time to view the spring wildflowers is during the peak season, which generally takes place from mid to late April at the lower elevations in the park and a few weeks later in the highest sections. Although the spring wildflowers can be seen virtually anywhere throughout the park, there are several wildflower walks that are especially good for viewing opportunities. One of the best trails is the Cove Hardwood Self-guiding Nature Trail that begins at the Chimneys Picnic Area on the Newfound Gap Road just 4.4 miles south of the Sugarlands Visitor Center. Other recommended trails include the Gregory Ridge Trail, the Little River Trail and the Porters Creek Trail. Whether you visit these trails or explore on your own, be sure to bring along your camera to capture the beauty of these natural wonders! The best way to learn more about the Smoky Mountain wildflowers is by attending the annual Spring Wildflower Pilgrimage, which runs from Tuesday, April 24 to Saturday, April 28 in the Great Smoky Mountains National Park. This fun and educational event features presentations and professionally guided walks that explore the region’s rich cultural and natural resources. The majority of the programs take place within the park, while the evening presentations are in the Mills Conference Center. Check out the full list of programs and be sure to sign up early, as this is a very popular spring event! Stay close to the beauty of the Smoky Mountain wildflowers this spring with a vacation at Heritage Cabin Rentals! Our affordable cabins are situated just minutes from the Great Smoky Mountains National Park and all of the exciting attractions in Pigeon Forge TN. 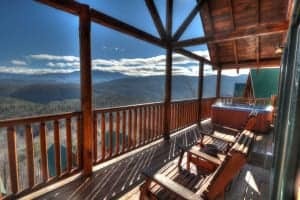 We have cabins ranging from 1 to 9 bedrooms, all of which provide comfortable lodging and wonderful mountain views. While staying with us, enjoy a wide range of amenities including full kitchens, game rooms, hot tubs, flat-screen televisions and more! Check out all of our cabins in Pigeon Forge TN today to plan your spring vacation to the Great Smoky Mountains where you can view the area’s gorgeous wildflowers! We hope to see you soon at Heritage Cabin Rentals!